If we have at least $1500 in sales, Lakeview can use 50% of the proceeds to buy books for the school! Help us reach our goal by spreading the word to friends, family and neighbours. The book fair is open to the public November 23, 4 to 7 pm. A flyer with a sample of the available books went home with students recently. Don’t forget to send in your ballot by Wednesday, Nov. 22, for a chance to win $25 in books for your family and $25 in books for your child’s classroom! Ballots are on the back of the flyer. 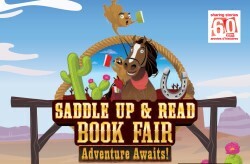 Tuesday, Nov. 21: Children can visit the fair to begin looking at the books (no purchases that day). Wednesday Nov. 22 & Thursday Nov. 23: Each class will have a turn to visit once again and make purchases. Thursday Nov. 23, 4 to 7 pm: The book fair will be open to parents and the public. This will be the last available opportunity to make purchases. Please contact lakeviewcouncilvolunteers@gmail.com if you can volunteer for this event! This entry was posted in School council event and tagged book fair, fundraising by Webmaster. Bookmark the permalink.